This past summer I was really impressed by a group of boys. They were our 2018 Super Senior Boys 1 (SSB1) and they embody the GREEN Values that we celebrate at Shibley. Many of these boys play competitive travel baseball. They are athletes, and they are the right kind of athletes. One evening after camp I watched some of them play and win a championship game. It was especially exciting for me; my daughters are passionate about dancing but I have fond memories of playing ball growing up. I also had the honor to be the special guest pitcher and play softball with SSB1 at camp. Each of these games was exciting, but the game played at camp showed a lot about these boys and all the boys as well as all the other boys in that group. They were competitive and took every play seriously. They were upset when they made an out. They showed disappointment when a teammate struck out or didn’t make an “easy” play. But all with the most respect and empathy you would want from any friend or child. They get it. They all do. You could see how they felt, but their sportsmanship was top notch win or lose. They moved on to their next activities with a smile. 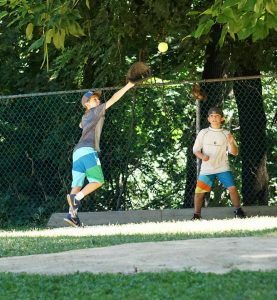 The campers in the group who excel at other sports or academics or swimming or singing also played hard and contributed positively to the success of their teams. Some surprised themselves and showed great improvement with the bat and glove from the beginning of the summer to the end. The sportsmanship taught by the counselors and displayed by the campers was exceptional. And then it’s these other campers’ time to shine when they go to cooking…and tae kwon do…and science… and theater…and arts & crafts…and the adventure park…etc. And at each of these venues all of the campers showed the same enthusiasm as when they were on the ball field. 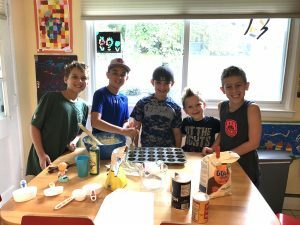 These boys couldn’t wait until Summer 2019 so they got together at home and became Shibley Chefs on their own. They are great children with great values instilled by the adults and role models in their lives, including of course the excellent SSB1 group staff. Some of the staff attended that championship game at night and have formed positive relationships with the boys over their summers at Shibley. 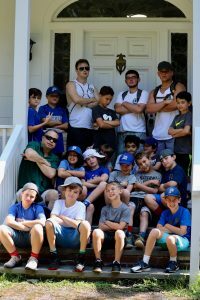 We are lucky to have loyal Shibley Group Leaders and Counselors that truly care about their campers and spend their own personal time supporting them. And we are lucky to have the boys of SSB1 at camp. We hope to see them (and you) at our Fall Festival in a few weeks.